While most growers view garden mums as a fall commodity, the possibility of enhancing spring and summer sales should not be overlooked. In the spring, garden mums can be sold as green plants along with perennial crops, or as flowering plants where they can be planted by the consumer to flower again in the fall. Garden mums can also be shaded and grown for markets in July and August. The most common market for garden mums continuesto be late summer and fall which will be the focus of this article. It is best to plant the rooted cuttings immediately. If necessary they may be stored for 2-3 days in a cooler at 33-40ºF. Before placing the plants in the cooler, inspect them for damage from heat or cold, broken cuttings, or wilted cuttings. Be certain that the rooting medium is slightly damp. Growth media. Any growth medium that is well-drained and aerated may be used for planting. The mix must be free of insects, disease organisms, weeds, and toxic chemicals such as herbicides. The pH for a soil-based medium should be 6.3 to 6.7 and 5.8 to 6.2 for a soilless medium. Have your mix tested prior to potting. Planting. 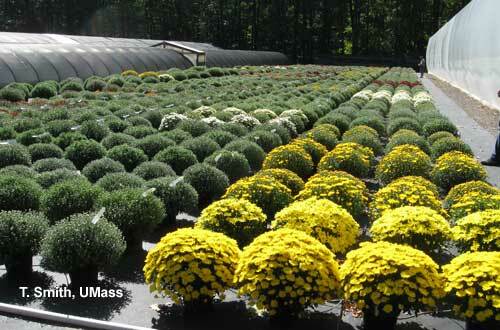 Most garden mums are grown with one rooted cutting planted per 8-inch mum pan or similar sized container. Larger 12-inch and 20-inch are used as novelty plants.The potting mix should be moist but not sopping wet. Plant cuttings at the same level cuttings were in the cell pack. Irrigate the medium after planting at least two times, and three if necessary, until the growth medium is wet. The final initial irrigation should contain 200 ppm each of nitrogen and potassium using 20-10-20. Some growers prefer to initially plant the cuttings in small containers and transplant them later into their final larger containers when more space is available. Crown Buds on Cuttings. Garden mums initiate flower buds easily and develop rapidly, especially if plants are stressed in any way. If terminal flower buds are observed when cuttings arrive, they should perform satisfactorily. When cuttings with terminal flower buds are planted, they should be pinched hard (allow 4-5 leaves to remain) when they are turgid (4-5 days after planting). This will force out lower breaks which tend to be more vegetative. If both terminal and lateral buds have developed when cuttings arrive, it is best not to plant them, as they most likely will not perform satisfactorily. When in doubt, talk to your supplier about the varieties being grown. The Ball Mum catalog states that new varieties pinch themselves by producing premature buds that do not develop but cause branching to occur. Premature Budding and Flowering. Chrysanthemums are short-day plants. Both flower initiation and development of the flower buds occur more rapidly under short days than long days. However, temperature has a greater influence than daylength on flowering of garden mums. Here in Massachusetts we can experience very cool nights in June. With several cool nights in a row, garden mums can initiate many buds prematurely which results in early flowering of the plants. If premature budding occurs, buds should be pinched off, and adequate moisture and fertilizer supplied. The plants will almost always continue to grow and develop into a quality fall crop. They may initiate flower buds under photoperiods in excess of 12 hours (spring and summer). Irrigation. Whenever possible, irrigate garden mums automatically (spaghetti tubes, drip tubes, subirrigation). Overhead irrigation is satisfactory and inexpensive; but the umbrella effect caused by the leaves and the effect of the winds results in a lot of wasted water. Also, wet leaves can encourage disease. To prevent foliar diseases always water early enough during the day to allow the foliage to dry before evening hours. Regardless of the watering system you use, do not allow plants to wilt particularly during the time before the lateral shoots (breaks) from the second pinch are at least one inch long. It is critical to keep plants actively growing in the early stages. Plants that undergo water stress are more likely to initiate premature flower buds. Fertilization. Begin fertilization as soon as rooted cuttings are planted. Weather is an important consideration for plants grown outdoors. Prolonged rainy periods will require additional fertilization to get plants growing. During the vegetative growth period, plants should be fertilized at each watering at a rate of 250 - 300 ppm using a complete fertilizer such as 20-10-20. High levels of fertilizer help prevent early bud set. Higher levels of fertilizer may also be needed during cool and prolonged rainy periods. Some growers prefer a high ammonia fertilizer such as 20-20-20 during the early stages of growth (first two weeks). After that growers rotate to 20-10-20. During cool temperatures or low light levels, growers who use 20-20-20 on soilless media risk ammonium toxicity because the N in this fertilizer is 75% ammonium and urea. Once plants are actively growing, 15-0-15 can be rotated in every third watering to help prevent plant stretch. Stop fertilization at the beginning of the last three weeks prior to sales. This will result in hardened plants which will ship better and last longer during retail sales. Controlled-release fertilizers (CRF). Regular application of water-soluble fertilizer is the most effective way of maintaining proper fertility levels. A water-soluble program gives the grower control over the fertility of the plants. Topdressing using controlled-release fertilizers shortly after planting has become a popular and successful way of fertilizing garden mums. Growers can choose the best rate based on fertilizer type, growing medium, irrigation practices, and pot size. Many growers use a 3-4 month release type in combination with liquid feed. Use weekly soil test results to monitor pH and EC of the crop and adjust the feed program accordingly. Controlled-release fertilizers should be applied by spreading the material evenly around and away from the base of the plant. Dumping it in one spot may cause localized hot spots. Use a level tablespoon when measuring. There is almost 25% more CRF in a heaping tablespoon than a level tablespoon. Manufacturer's recommendations are based on a level tablespoon. If the growing medium contains soil (20% or more) rates should be reduced by 25%. Nutrient release is temperature dependent and nutrient movement is dependent on watering and rainfall. Nutrients in controlled-release fertilizers will release faster when growing medium temperature is above 70F. Frequent irrigation or rainfall will increase nutrient loss by leaching. Excess soluble salts may occur during warm periods if leaching is inadequate. Spacing. Spacing will vary from grower to grower depending on finished pots size. Space pot to pot until the first pinch then move to a final spacing, depending on variety. Space so plant foliage does not touch each other. Eight-inch pots can be spaced on 18- to 24-inch centers. Garden mums grown too close together may develop a "stove pipe" appearance. Pinching. Today's cultivars have been bred so that they do not need to be pinched. They branch naturally. If this method is new to you, trial it on a small scale before devoting the entire crop to it. This technique is only successful if planting actively growing cuttings and fertilizing them heavily, especially during the first few weeks of production. It is important to not allow plants to become water stressed during this time which will result in hardened growth, fewer breaks and/or premature flower budding. Also, cultivars should be chosen that breeders recommend for this program. Some growers feel more comfortable pinching a crop. If so, no problem, it will not harm the plants. If pinching, the first pinch is usually made when roots of the cutting reach the bottom and sides of the container and the tops show 1.5-2.0 inches of new growth. Allow 6-7 leaves to remain following the pinch. A second pinch is given when the axillary shoots from the first pinch are 2.5-3.0 inches long. This pinch should be made prior to July 20th. Allow 3-4 leaves to remain following the second pinch. Some growers have had success planting two or three weeks later than normal, use two cuttings per pot, and giving only one pinch. Some growers instead, pinch rooted cuttings one time when plants are still in the plug trays just prior to transplanting. Growth Regulators. If garden mums are grown outdoors in full sun and properly spaced, there is no need for growth regulators. Thanks to good genetics, modern cultivars branch naturally and short days will intitiate flowers automatically. Traditionally B-Nine was used on taller garden mum varieties. The first application was made when breaks following the second pinch were two inches long. The rate recommended was 2500 ppm. Additional applications, if required, were made at two week intervals. A marker stick was used to track the weekly growth rate. Every seven days the height of the plants were marked on a wood label inserted in the pot. If Pinching -First pinch: Approximately two weeks after planting (roots must be at bottom and sides of pots, and 1.5 to 2.0 inches of new growth must occur). Second pinch: When breaks following first pinch are 2.5 to 3.0 inches long. Flower: September 10 to October 10, depending on cultivar. Fall garden mums are best produced outdoors or in an uncovered greenhouse with proper irrigation. Temperature and humidity levels are often too high in a covered greenhouse for many cultivars. Cool night temperatures promote early flowering of garden mums while very warm night temperatures can delay flowering. Expect garden mums grown in a covered greenhouse to flower two weeks later than those grown outdoors for fall sales. Some growers plant 2 pinched plants per 8" pot during the first 2 weeks of July and do not pinch again. Water and feed immediately and regularly to push this crop. Cultivars flower up to a week later than natural season, allowing a longer period of sales. Because they are naturally later, their buds are seldom harmed by early frost. The fast crop is a real time and cost saver with only 9-10 weeks of crop time compared with 15-16 on the regular program. More than twice as many plants can be grown in the same area since the fast crop will make smaller finished plants, 10-14 inches in diameter. Fast crop 6" pots can be planted at the same time with one rooted cutting per 6.5 inch pot. Pests. A clean production area is important to disease and insect prevention and prevention saves money. Train your employees to "think clean" at all times. Pests of garden mums include aphids, mites, various caterpillars, leafminers and thrips. The main goal is to keep pest levels low enough to prevent plant injury. The most common disease problems are pythium root and stem rot, fusarium wilt, bacterial leaf spot, botrytis blight, and most recently, Chrysanthemum white rust. Many diseases are best prevented by using a well-drained growth medium and by proper spacing to allow good air movement. Also, do not water late in the day. Chrysanthemum white rust is a recent disease problem for growers and is currently a quarantined pest.The New England Greenhouse Floriculture Guide provides current information on pest management. Other Problems. During some years, growers have problems with early flowering and/or too short plants. These two problems may have been caused by low night temperatures early in the season. Low night temperatures speed flower bud initiation resulting in early flowering and shorter plants. Cultivars. Plant breeders have been active in developing new cultivars of garden mums. Features that breeders look for include plant habit, flower form, flower color, branch flexibility, foliage durability, disease resistance, time of flowering and keeping quality. Try a few different varieties and keep records on their performance. This will help to fine-tune cultivar selection for future production. Maintaining Quality Plants. Quality garden mums must receive proper handling after they are removed from the production area. Shipping and storage time in the box should be as short as possible. Optimum temperatures for holding and shipping plants are 38-40F and optimum conditions for displaying plants are 45-60F with high light levels. Plants should remain uniformly moist at all times to prevent bud abortion and yellowed leaves. Retailers should note that hardiness and longevity are of prime interest to many consumers. Attempt to learn something of performance of the cultivars you sell. Plants which produce the greatest number of stolons and an abundance of new shoots from just below the soil line are more apt to survive the rigors of winter. Field Production A few growers still prefer to grow their garden mums in the field and then dig them in the fall or have customers dig their own. As a guideline, space plants 18-24 inches apart, in rows 30 -36 inches apart. Prior to planting apply any needed lime or phosphorus based on a soil test. Water cuttings immediately after planting with 1 to 1.5 pounds of 20-20-20 per 100 gallons of water to help establish the plants more rapidly. Two weeks after planting sidedress dry 5-10-5 fertilizer down the rows, at the rate of 3 to 4 pounds per 100 linear feet. Place fertilizer about 3-4 inches from the plant. Repeat at one-half this rate four weeks later. It is important to provide additional water during hot and dry weather. An adequate supply of water throughout the growing season is essential to insure optimum plant growth and flowering. Check with your plant supplier for garden mum cultivars that are adaptable to field growing and subsequent digging. It is a good idea to provide shade and ample water for a few days after digging and potting before offering them for sale. This will help acclimate the plants. Customers may not be receptive to wilted plants due to "transplanting shock".